The Okataina caldera is an active volcano which has erupted six times in the last 10,000 years – most recently in 1886, when a giant fissure opened up along the lava dome that forms Mt Tarawera. The sequence of eruptions have built up the Haroharo and Tarawera mountains. By blocking drainage they have also shaped the lakes of the caldera, notably Tarawera, Okataina and the eastern arm of Rotoiti. 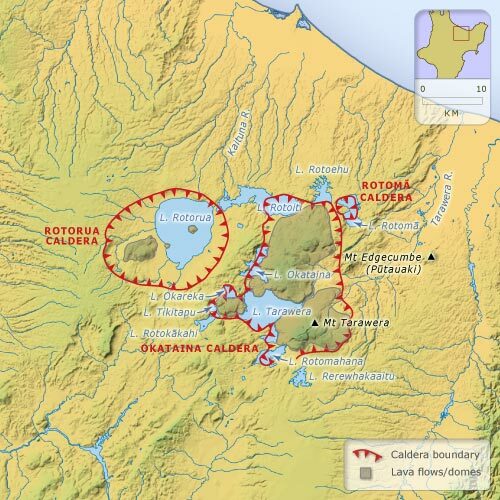 The neighbouring Rotorua and Rotomā calderas have only one lake apiece. Source: based on information in J. M. Soons and M. J. Selby, eds, Landforms of New Zealand. Auckland: Longman Paul, p. 116.